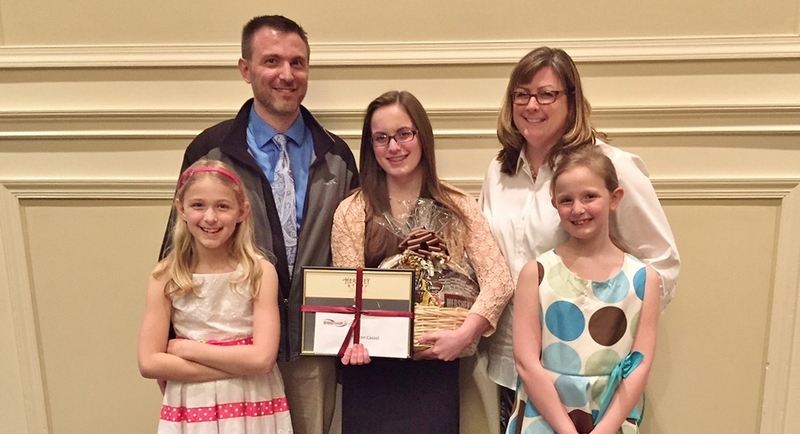 Manor Middle School eighth-grader Peyton Cassel’s fictional story about the Salem witch trials has earned her a top award in the 2015 Hershey Story History Contest. Peyton’s entry, Bewitched, won first-place honors in the senior fiction division. The story is a first-person account of an accused witch’s final day before she is put to death in July 1692. The contest attracted more than 475 entries from students in grades 5 through 8 from a seven-county area. The entries were judged by a panel of historians, educators and community leaders based on their historical accuracy, creativity and compositional structure. As a first-place winner, Peyton received a plaque, $100, a family membership to The Hershey Story museum, Hersheypark passes — and a basket of chocolate to share with her classmates. 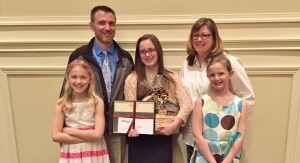 She was honored for her writing at The Hershey Story’s Business Partners in Education Annual Breakfast April 17. Congratulations, Peyton, on your well-deserved award! Click here to read her winning story. Manor MS eighth-grader Peyton Cassel at the awards ceremony with, from left, sisters Emma and Mackenzie and parent Steve and Jennifer Cassel.